Along with proteins, nucleic acids, and carbohydrates, lipids are one of the major classes of biologically important molecules (or biomolecules). They are water-insoluble, organic compounds that are highly soluble in nonpolar organic solvents and are found in organisms and their secretions. Although the term lipid is often used informally as a synonym for fat, the latter refers to a subgroup of lipids called triglycerides. Unlike other groups of molecules, lipids comprise a broad and diverse range of structures, which also include phospholipids (components of cell membranes), sterols (most notably cholesterol, and the steroid hormones), and more complex lipid derivatives such as glycolipids (sugar-linked lipids). Despite the controversy surrounding certain lipids (particularly fats and cholesterol), many lipids are essential for life, playing a number of important roles in nutrition and health. The production, transport, and recognition of these complex molecules involve harmonious coordination with numerous other biological materials, including binding proteins, enzymes, and receptors. The presence or absence of lipids, or a disruption of lipid metabolic enzymes and pathways, can significantly impact the state of health of an individual. Individual responsibility also plays a role, as overconsumption of certain lipids, such as cholesterol and trans fatty acids, may be risk factors for cardiovascular disease and other circulatory diseases. Structuring cell membranes. The cell membrane constitutes a barrier for the cell and controls the flow of material in and out of the cell. Energy storage. Triglycerides are an efficient form of energy storage that can be mobilized when fuel is needed. Transmission of information in cells (signal transduction). Lipid hormones, like steroids and eicosanoids, also mediate communication between cells. Cellular metabolism. The fat-soluble vitamins A, D, E, and K are required for metabolism, usually as coenzymes. 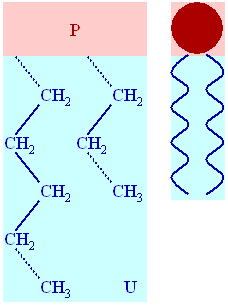 Many lipids consist of a polar head group (P) and a nonpolar tail (U for unpolar). The lipid shown is a phospholipid (which has two tails). The term "lipid" is really a catch-all phrase for a wide variety of hydrocarbon-based molecules of biological origin. Lipids encompass a huge range of structures, which can be aromatic or aliphatic (with or without a benzene ring), acyclic (open-chain) or cyclic (ringed), straight or branched, saturated or unsaturated, flexible or rigid. This diversity makes it impossible to define lipids on the basis of a single core structural feature or biosynthetic origin. However, one shared property of many lipids is that they are amphipathic (or amphiphilic) molecules; that is, contains both hydrophobic and hydrophilic groups. Although lipids are predominantly nonpolar or hydrophobic ("water-fearing"), meaning that they do not interact well with polar solvents like water, most lipids also have some polar or hydrophilic ("water-loving") component. In the case of cholesterol, the polar group is a mere -OH (hydroxyl or alcohol). For the membrane lipids called phospholipids, however, the polar groups are considerably larger and more polar. The amphipathic character of the phospholipids, in particular, directly influences their biological function, causing them to spontaneously organize into cellular or intracellular membranes in water. Within the aqueous environment of the body, the polar heads of lipids tend to orient outward to interact with water molecules, while the hydrophobic tails tend to minimize their contact with water by clustering together internally. Single-tailed amphipathic lipids form a small sphere called a micelle (pictured at left), while two-tailed phospholipids form lipid bilayers, which create a hollow sphere that encloses a separate aqueous compartment. These lipid bilayers are the structural components of the cellular membranes as well as intracellular compartments called organelles. Fatty acids, which are a group of carboxylic acids (organic acids with a terminal carboxyl group, -COOH) that can be used as fuel molecules and serve as components of many other classes of lipids. Glycerides (or glycerolipids) are lipids with a glycerol backbone; they include monoglycerides, diglycerides, and triglycerides, as well as the phosphoglycerides (or glycerophospholipids) found in biological membranes. Nonglycerides, which have a non-glycerol backbone, includes sphingolipids, sterol lipids (such as cholesterol and the steroid hormones), and prenol lipids (such as terpenoids), waxes, and polyketides. More complex lipid derivatives, such as sugar-linked lipids (glycolipids) and protein-linked lipids. An alternative classification system has been proposed (Fay 2005), which instead divides lipids into the following groups: (1) fatty acyls, (2) glycerolipids, (3) glycerophospholipids, (4) sphingolipids, (5) sterol lipids, (6) prenol lipids, (7) saccharolipids, and (8) polyketides. Saturated fatty acids have no double bonds between the carbon atoms of the fatty acid chain (hence, they are fully saturated with hydrogen atoms). Unsaturated fatty acides have one or more double bonds. The presence of double bonds generally reduces the melting point of fatty acids, enhancing the fluidity of unsaturated fatty acids and their derivatives. Unsaturated fatty acids can occur either in cis or trans geometric isomers. 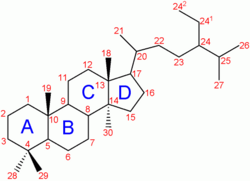 In most naturally occurring fatty acids, the double bonds are in the cis configuration. However, trans bonds are characteristically produced during the industrial hydrogenation of plant oils. Research suggests that, for reasons not yet well understood, increasing amounts of trans fats correlate with circulatory diseases such as atherosclerosis and coronary heart disease. When they are not attached to other molecules, fatty acids are known as "free" fatty acids. They may derive from the breakdown of a triglyceride into its fatty acids and glycerol components. Free fatty acids are an important source of fuel for many tissues since they can yield relatively large quantities of ATP. Although many cell types can use either glucose or fatty acids for fuel, heart and skeletal muscle prefer fatty acids. On the other hand, the brain cannot use fatty acids as a source of fuel. During starvation or periods of low carbohydrate intake, the brain relies instead on glucose or on ketone bodies produced by the liver from fatty acid metabolism. The characteristic structure of a triglyceride, with a glycerol head (left) attached to three fatty acid tails. This example of an unsaturated fat contains the fatty acids palmitic acid, oleic acid, and alpha-linolenic acid. Glycerides have a glycerol core structure and one or more fatty acyl groups, which are fatty acid-derived chains attached to the glycerol backbone by ester linkages. Glycerides with three acyl groups (triglycerides) are the main storage form of fatty acids in animals and plants. Triglycerides (which are also known as triacylglycerols or triacylglycerides) are stored in specialized cells called adipocytes, which comprise the adipose tissue that cushions and insulates the body. Triglycerides play an important role in metabolism as concentrated, efficient energy sources. They contain more than twice as much energy (9 kcal/g) as carbohydrates and proteins. Triglycerides are important as the primary form of energy storage because they are reduced and anhydrous, as opposed to the more polar carbohydrates, which need to be stored with water. Phospholipids are the major constituents of biological membranes, such as the cell's plasma membrane and the intracellular membranes of organelles. 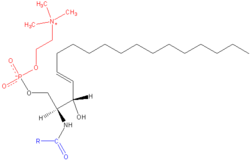 They are derived either from glycerol, a three-carbon alcohol, or sphingosine, a more complex alcohol. The former, called phosphoglycerides (or glycerophospholipids) consist of a glycerol backbone, two fatty acid chains, and a phosphorylated alcohol. In addition to their structural function described above, phospholipids also play a role in cell signaling. For instance, the polar head groups or fatty acid tails can be released from specific phospholipids to generate the second messengers that are used in signal transduction to relay signals within a cell. While phosphoglycerides are the major component of biological membranes, other nonglyceride lipid components like sphingolipids and cholesterol are also found in biological membranes. Cholesterol and triglycerides are transported in body fluids in the form of lipoproteins, the natural carrier molecules of the body, which are classified according to density. When doctors talk to their patients about the health concerns of cholesterol, they are often referring to "bad cholesterol," or low-density lipoprotein (LDL). "Good cholesterol" is high-density lipoprotein (HDL). Both types of cholesterol have biologically important roles in animals: LDL transports cholesterol to peripheral tissues and regulates the synthesis of cholesterol at these sites, while HDL "sweeps" the blood of cholesterol released into the plasma from dying cells and from membranes undergoing turnover (regeneration). However, high levels of LDL in the blood may lead to the build-up of atherosclerotic plaques in arteries, which may in turn result in cardiovascular disease. Cholesterol is an important precursor of the steroid hormones. Steroid hormones produce their physiological effects by binding to steroid hormone receptor proteins, which causes changes in gene transcription and cell function. Fahy, E., S. Subramaniam, H. A. Brown, C. K. Glass, A. H. Merrill, Jr., R. C. Murphy, C. R. H. Raetz, D. W. Russell, Y. Seyama, W. Shaw, T. Shimizu, F. Spener, G. van Meer, M. S. VanNieuwenhze, S. H. White, J. L. Witztum, and E. A. Dennis. 2005. A comprehensive classification system for lipids. J. Lipid Res 46:839-862. Wenk, M. R. 2005. The emerging field of lipidomics. Nat Rev Drug Discov. 4(7):594-610. This page was last modified on 15 October 2010, at 01:50.